This chapter introduces the use of wikis and written and voice web applications as supporting tools for collaborative writing. It reports on a study examining the processes advanced Spanish foreign language learners engage in while working collaboratively using wikis and chat to complete a writing assignment. Through analysis of students’ essays, wiki-based drafts, chat transcripts, and questionnaire responses, it was observed that students maintained an interest in their essays’ accuracy as well as a focus on global rather than local aspects. In addition, the combination of wikis and chat provided students with an environment in which to state a clear thesis, provide supporting evidences, and refine the organization of the essay in a manner often missing in individual work. The authors expect that the benefits observed when using social web applications while working collaboratively will provide more evidence for pedagogical shifts that will help students become better writers in their second language. 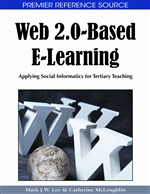 The burgeoning interest in Web 2.0 technologies such as Flickr, Facebook, blogs, and wikis is indicative of the growth of participatory, collaborative practices in society at large (O’Reilly, 2005). However, within the realm of foreign language (FL) education, the practice of collaboration, in particular collaborative writing—two or more people working together to produce a document with group responsibility for the end product (Bosley, 1989, cited in Ede & Lunsford, 1990, p. 15)—has only been cautiously approached to date. Yet, scholars in first language (L1) and second language (L2) writing have shown that collaborative writing promotes reflective thinking, focuses attention on grammatical accuracy, lexis, and discourse, and encourages a pooling of knowledge about language (Donato, 1994; DiCamilla & Anton, 1997; Hirvela, 1999; Storch, 2005; Swain & Lapkin, 1998). The success of a collaborative writing endeavor is evidenced by students being truly involved and engaged in the activity (Forte & Bruckman, 2006; Schaffert, Bischof, Buerger, Gruber, Hilzensauer, & Schaffert, 2006). Collaborative writing has been recently aligned with Web 2.0-based social software applications such as blogs or wikis (Alexander, 2006). These applications provide for authoring flexibility, content creation, and the generation of new knowledge. The open editing and review structure of wikis makes them the most suitable tool to support collaborative writing (Parker & Chao, 2007). Their collaborative value can be further enhanced when accompanied by the use of web-based audio applications such as Voice Direct, a synchronous voice conferencing/chat facility (see University of Maryland Baltimore County, n. d.). This combination of tools can lead to increased levels of interaction and accountability of the participants (Rick, Guzdial, Carroll, Holloway-Attaway, & Walker, 2002). At the same time, however, wikis challenge some of the traditional notions of authorship as understood in Western literary theory in a way that tends to unsettle the student-endorsed model of solitary authorship. Therefore, given the increasing use of social software for L2 educational purposes, there are questions and concerns about its viability in the classroom and the benefits that its use may bring to the L2 writing process. To what extent does students’ knowledge about writing in Spanish benefit from the use of wikis and chat? How do these students approach a collaborative writing task (e.g., what writing processes are observed) when using wikis and chat? What are the differences in terms of fluency, accuracy, and complexity between the first and final turn-in drafts when writing collaboratively in wikis?